What do you usually have for breakfast? Toast, Eggs, Pancakes or just leftovers from yesterday? We all know that breakfast is the most important meal of the day. Breakfast like a king, lunch like a queen, and dine like a pauper. To figure out why it is so beneficial for your body, here are ten surprising reasons you should never skip breakfast. You might think that you should eat less during the day to lose weight; therefore you skip your breakfast, or have only a cup of coffee in the morning. But this is completely wrong. Studies show that people who skip their breakfast are 50% more likely to become overweight. The secret is that when you sleep, your body doesn't produce enzymes that are needed to burn fat and lose weight. When you eat something in the morning, you literally turn them on. Having breakfast actually increases your level of concentration and improves your memory and other mental abilities. It is the source of energy that your brain needs after a night of fasting. It is scientifically proven that people who eat breakfast every day have a more nutritious diet. Nutrients provide help your body function properly, as long as your breakfast includes protein, carbs, vitamins and minerals. At night, your body slows down its rhythm to run without nutrients for at least eight hours. This is a long time to go without eating. 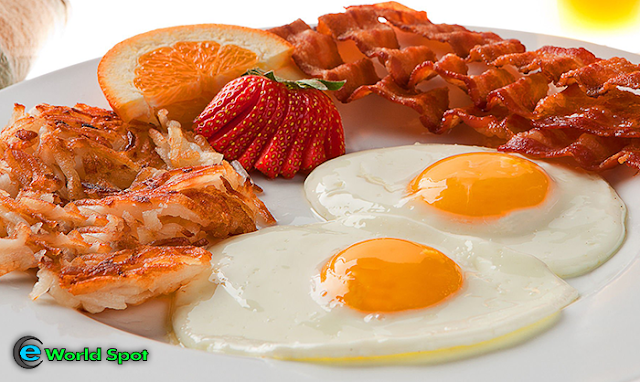 Therefore, after you wake up in the morning, you should eat a good breakfast to boost your metabolism. If you skip breakfast, you set yourself up for low blood sugar, which can trigger anxiety. If you want to feel awake in the morning, choose oatmeal, fruit, protein cocktails, or scrambled eggs for breakfast. Do not forget to include greens, such as a green cocktail, salad or raw vegetables in your breakfast. Greens are rich in magnesium and chlorophyll that help relieve stress and anxiety. Breakfast provides vitamins and nutrients. As a result, you're full of energy and ready to exercise and burn off all those fat deposits. Also, if you've had a good breakfast you won't get too hungry and overeat at lunch. A healthy diet, which includes having breakfast every day, helps reduce the risk of hypoglycemia, hypertension and diabetes. Want to stay healthy and away from the doctor? Never skip your breakfast. Although it may sound strange, it's a scientifically proven fact. The nutrient intake in the morning does make you feel happier. 2. Breakfast improves your heart health. A healthy breakfast improves blood cholesterol levels. According to Harvard Medical School, eating breakfast, especially one that includes whole grains, reduces the risk of heart attacks, strokes and heart failure. Eating breakfast together is a great way to spend quality time with your family, So, instead of having a coffee on your way to work, enjoy that special moment in the morning with your loved ones.